Florida Polytechnic University President Randy K. Avent, left, and Provost and Executive Vice President Terry Parker, right, welcomed Erica Lutes, executive director of Fulbright Belgium and Luxembourg, who recently visited campus and met with administration, faculty and students. 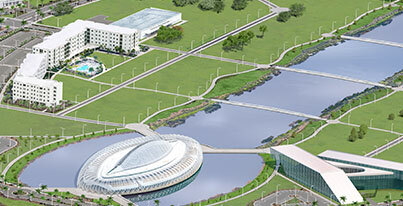 Florida Polytechnic University welcomed Erica Lutes, the executive director of the Commission for Educational Exchange between the United States, Belgium and Luxembourg – otherwise known as Fulbright Belgium and Luxembourg – to its Lakeland, Florida, campus on Jan. 16. Lutes toured the campus and met with University administration, faculty, and students. 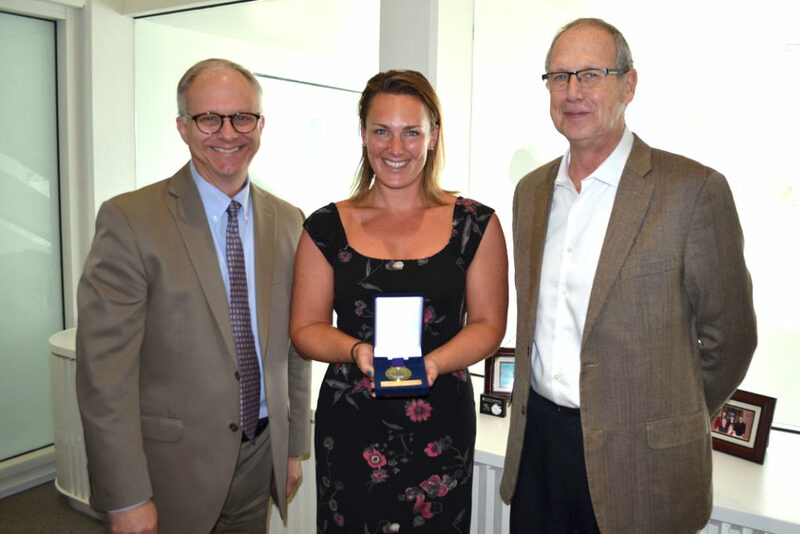 She was also presented with a medallion as a symbol of the global partnership that was established nearly a year ago to provide exchange opportunities between Florida Poly and the European nations. 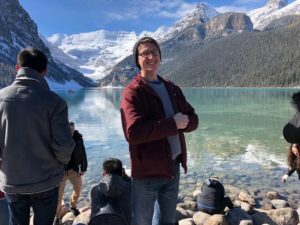 Lutes, who has been with Fulbright Belgium and Luxembourg for seven years, said that one common misconception people have with the Fulbright program is that it’s open to only a select few. 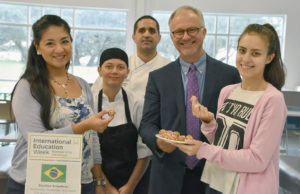 The partnership is one of a growing number Florida Poly has developed as it continues to create international academic exchanges. The most recent agreement was with Fulbright Australia, which will be formally signed at a ceremony in Canberra, Australia, in February 2019. 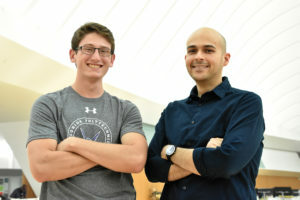 For more information on how to represent Florida Poly as a Fulbright scholar or to come to Florida Poly from one of its Fulbright partners, contact Mustapha Achoubane, associate director of International Studies. Did you know? Fulbright alumni have achieved distinction in government, science, the arts, business, philanthropy, education and athletics. 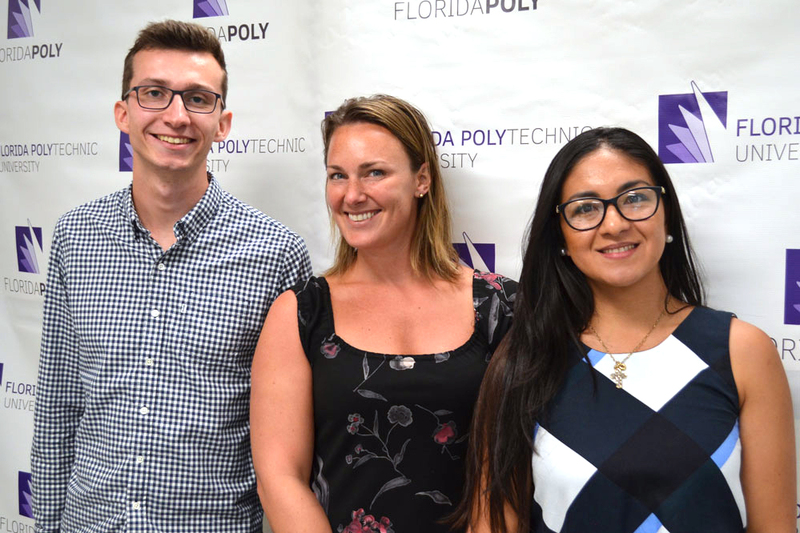 Marius Brinkmann, left, a Fulbright scholar and graduate student from Ansberg, Germany, met with Erica Lutes, center, the executive director of Fulbright Belgium and Luxembourg, during her recent visit to Florida Polytechnic University. Maria Paula Gomez, is a graduate student from Tucuman, Argentina.